Gavin has been in the industry for over seventeen years and joined Newton Fallowell in 2010 where he quickly established himself as a much-valued member of the team. He started his career in estate agency as a trainee negotiator and over his time in the industry he has worked his way up through senior sales to valuer to now being Grantham’s Branch Manager. This experience at all levels means that he has a full understanding of all elements of the business. He is extremely passionate about the industry and after an early stint as a trainee butcher decided the move to estate agency was for him. One element of the industry that Gavin particularly enjoys is the fact that every day is different from the next as well as that there is a family environment within the office as they often spend more time together than with their respected families. Gavin says that the smooth running of the team can be a reflection of the service you will receive. He was born in Grantham and has lived all his life in the nearby village of Ancaster and from this he knows everything there is to know about Ancaster and has an excellent knowledge of the surrounding areas. Gavin is often the first point of contact when visiting the office and oversees the day to day running of the Grantham office. 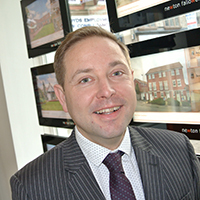 He prides himself on creating mutually strong working relationships with developers and investment buyers. As a likable and warm member of the team there is no job is too small or too large for Gavin and he is willing to get stuck in to any challenge thrown at him. Due to his wealth of experience within the industry he is a very important member of the team and often motivates others as well as advising and guiding new members of the team. In his spare time Gavin enjoys fishing and supporting his local football team, Nottingham Forest. He also enjoys spending quality time with his wife, Laura, as well as spending time with his two boys, Charlie and Alfie, and regularly watches them play at Grantham Town Football Club. One tip that Gavin suggests to all buyers and vendors is that to reduce stress it is advisable to use an estate agency that can provide a whole package, for example financial advice to conveyancing services, as Newton Fallowell do. He believes that this can lead to a more straight forward process as they can support you throughout the whole journey.